It's afternoon. When I look out the window, I find a familiar scene; endless rows of rectangular apartment windows, trees and so-called patches of garden here and there, playgrounds comprising red, yellow, and green plastic slides and swings. But they are always empty. It's summer break, but everything seems so quiet and deserted. No kids are running around. Teenagers are nowhere to be seen. Only the sound of cicadas fills the hot, humid air. This is not at all a surprise. People here just accept it. They do not raise questions – at least not out loud – about why there aren't any kids jumping about. We all know where they are. Instead of going to playgrounds and parks, children sit on chairs, listening to lectures and solving math problems in academies – hagwons in Korean. Some are as young as nine or ten. Others mostly teens. For high schools students like me, it is very natural to spend long hours in hagwons. I have never met anyone who loved being there, or who enjoyed listening to the teacher's monotonous lectures about easy ways to get good grades. Students endure it. They believe, and are taught to believe that they must perform well in school to enter prestigious universities. The society tells them that going to a famous university is the start (and possibly the only start) of a successful life. 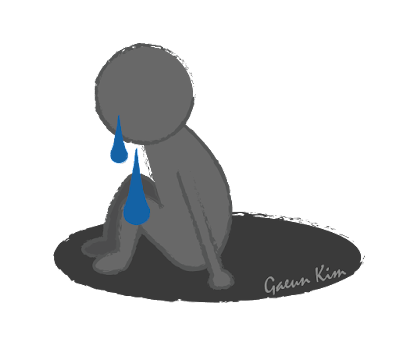 In the Korean society, studying for schools is a painful and tough procedure every student must go through to live happily in the future. Students who refuse to cope with this difficulty and try to seek meaning in something else are considered foolish. I once came across a video on Facebook that was made to motivate teenagers to study hard. It said that we must suppress our various desires (such as wanting to hang out with friends or having too much interest in collecting comic books) and focus only on studying. According to that video, if we only endure three years of tough work in high school, we would become happy university students who would be able to do whatever we wanted. Really? I solemnly look at the empty streets in my town. It is sad to imagine my peers and elementary school kids being all day at hagwons and wishing nothing but the classes to be over. Learning is not supposed to be like this. It isn't meant to be a tool to get into universities or a deadly noose that squeezes out all the energy from the kids. It is something that should be interesting, or at least not be painful. Why has the act of learning things on a book become so opposite of the act of learning the melodies of a new pop song? Why does one give stress to so many people while the other brings a smile? If only kids were not forced to study, if only studying algebra was the equivalent of chatting under the sun, wouldn't things have been better? It's afternoon. Cicadas sing, and students still study in silence.